We are a material handling company, but spend a great deal of time and resources working on safety issues for our client base. Do you need help with ergonomic issues, industrial traffic management, fall protection, and storage issues that relate to worker safety? Our specialists can help you find a better way to operate that helps prevent common types of industrial injuries and their costs. Call us today for assistance. AisleCop® helps manage forklift and pedestrian traffic in industrial facilities, at high-traffic or low-visibility crossings, plant entry points, etc. Helps reduce risks when forklifts and pedestrians interact. We help our clients install guardrail systems from ultra heavy duty rails to hand railing, to flexible impact systems. Call us for fast assistance. 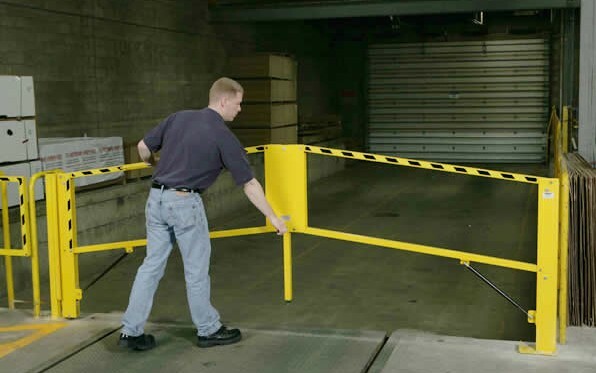 Help alert workers and forklift drivers around corners, in rack rows, near loading docks, as they enter a plant or cross an aisle. A variety of sensors with audible & bright light or flashing warnings for many situations. Forklift Approach Warning Lights - "Blue Lights"
Bright light on the floor helps alert pedestrians to approaching forklifts, walkies, loaders, AGV's and other industrial vehicles. Install safety nets to help prevent falling cartons or other items from pallet racks and conveyors.